This book is particularly interesting in that it begins by trying to justify its existence, and the author’s interest in medieval history, to two very different and often antithetical audiences, even while writing a book for a third audience yet. The author seeks to defend himself from accusations that his interest in medieval history does not prove any sort of reactionary alt-right political beliefs—and he uses those terms—and he delivers on his promises to include discussions about women, diversity, and the LGBTQ community in this book. To a different audience, the author then promises that medieval history is worthwhile from a commercial standpoint because it is popular to a wide audience, showing its commercial appeal in an age of austerity in the world of social sciences in Academia. Yet this book is written, properly speaking, neither to politically-minded audiences whose mistrust in medieval history is profound nor to an audience interested only in the popularity of medieval history and entertainment like Game of Thrones. 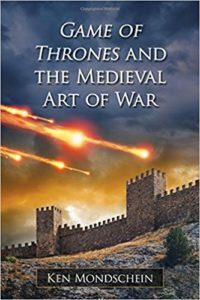 Instead, this book is aimed at providing an academic defense of the legitimacy of George R. Martin’s approach to medievalism in his Song of Ice And Fire series, and it succeeds at providing material of interest to someone who is at least a casual fan of the series as well as being interested in medieval history. In terms of its contents, this book is made up of an introduction and nine short essays that total around two hundred pages before the book comes to its sources, endnotes, and index. The introduction seeks to defend the purpose of this work as an academic work of history devoted to a popular series of fantasy novels and an associated television show. After this comes a complex handling of the issue of chivalry, tied in as it is with the complexity of religion and gender and class in the Middle Ages, demonstrating its complexity in Martin’s work as well. Two chapters follow that deal with weapons and armor contrasted between the steady development in the Middle Ages and stagnation in the world of Westeros. The author then looks at the development of fighting arts in Martin’s novels as well as the variety of fighting arts and the sources that we have about them from the Middle Ages, demonstrating again a high degree of complexity and verisimilitude in Martin’s presentation. The author looks at the wager of battle and the relationship between war, duels, and tournaments to place the events of the Game of Thrones series as being a late medieval conflict over control of a state, where battles were common, rather than an early medieval setting where sieges prevailed. After this comes a look at the economics of feudal warfare and the way that the lack of weapons and armor development in Martin’s world-building is intricately related with problems of logistics and economic stagnation in the face of extreme climactic shifts between summer and winter periods. A chapter on the women warriors of Westeros and how they match up with real life equivalents allows the author to deal with gender and sexuality politics and provide more praise to Martin for his thoughtful portrayals of female warriors, before the book concludes with a chapter on the relationship between conquest and culture and a comparison of ten atrocities in Martin’s novels and some Medieval atrocities that were even worse. In reading this book it is fascinating to see how the author demonstrates his knowledge of medieval texts from Frossiart to Vegetius and to more obscure sources, as well as to blogs about people of color in the Middle Ages and how he attempts to dance along the razor’s edge between his espousal of progressive politics and his defense of Martin’s novels as well as the world of role playing games and medieval reenactments that provides a context for the serious appeal of this work to a large and often marginalized subculture in contemporary society. Mondschein tries to appeal to both sides of this audience, on the one hand showing his academic bona fides to an audience that is skeptical of the political ideology of medievalism in contemporary society and on the other hand showing his involvement in the Society For Creative Anachronism and other efforts at bringing the past of the Middle Ages to life. Even if the reader may not always be in agreement with the author’s perspective and worldview, the attempt to bridge the divide between those who appreciate the medieval past and those who seek to focus their efforts on contemporary cultural politics is one that ought to be celebrated, not least because the divide the author sits astride is one that has the potential for a great deal of conflict in our own world, something that the author appears deeply conscious of. A book like this is obviously not for everyone, but the author’s masterful understanding of texts and his candor about his own perspective and approach ought to earn him an appreciative reading among those who are interested in an appealing academic approach to medieval history as well as to George Martin’s novels and the associated Game of Thrones television show. For those who combine an academic interest in the Middle Ages and find popular treatments of the Middle Ages to be appealing, this book provides a way to ground the fictional treatment of a world similar to the Middle Ages of our own world in a sensitive portrayal of its historical context, its thoughtful handling of cultural issues, and its grounding in a sound understanding of economics and technology. The author, it should be noted, is generous in his praise of others who deal with similar concerns in their work and who have helped him to provide an explanation of the Middle Ages that seeks to appreciate its popularity as well as its relevance to contemporary cultural politics, and the author remains able to balance both popular and academic concerns in this work to a remarkable degree.